Framed by real stories and grounded in research, the second edition of Transformative Leadership in Education　presents an alternative approach to leadership that is engaged, active, and courageous. 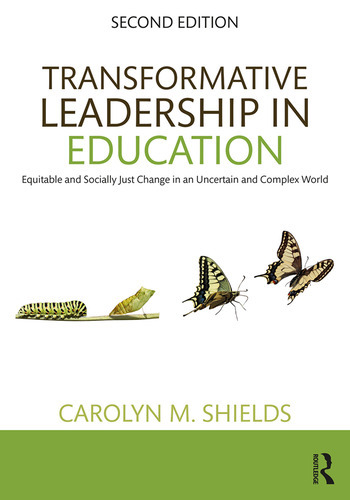 Noted scholar Carolyn M. Shields explores the concept of transformative leadership and its potential to create learning environments that are academically excellent, equitable, inclusive, and socially just, even in the face of the volatile, uncertain, complex, and ambiguous world of education today. Chapters combine contemporary research findings with stories of schools, leaders, students, teachers, and community members to demonstrate that transformative leadership can promote academic achievement, family and community empowerment, democratic engagement, and global citizenship. This exciting text will appeal to all aspiring and practicing leaders who want to prepare students to be successful, caring, and engaged citizens of the global community. Updated end-of-chapter guiding questions to help readers reflect on their own practice and to apply the concepts in their own contexts. Enriched discussion of the interrelationships among the eight tenets of transformative leadership and leading for social justice. Elaborated discussion of the need for reflection, grounding, and spiritual connections on the part of transformative leaders. Expanded discussion of refugee and transgender students. Supplemental eResources to prompt further dialogue and reflection, downloadable at www.routledge.com/9781138633773. Carolyn M. Shields is Professor of Educational Leadership in the College of Education at Wayne State University, Detroit, USA.